Wolverine was super RAD! As in the Movie. All around great acting and story. Although Silver Fox was played by a Puerto Rican! Just a killer flick. Yeah I'm a bit biased, being that Wolverine is my hands down absolute favorite character of all time. But Leiv Schrieber's portrayal of Sabertooth was unparreled. He nailed it on the beak ya'll! Such a savage berserker and yet honorable evil self serving [email protected]$$! Yeah buddy! I also have been dusting off my comics and have since delved into the old 1995 Summer Cross-Over of the X-Titles. Entitled: The Age of Apocalypse. Such gritty awesome writing. Although some of their artists can't draw a woman's posterior to save their lives. They all resemble a barbie doll, as in totally wierdly flat. But again it was the 90's and folks weren't interested in a woman's more amorous features; sides her bossom. But all that aside, great writing by all involved. It is cool to see what twists the artist for those books took on our familiar characters. And to see what alliances some of our hero's or would be heros took. I won't spoil any plot for those of you fellow comic fans who haven't read that particular run or are new to the X-Titles. But new and old fans alike I believe will dig that old X-Over. I actually didn't manage to buy X-Man nor Factor-X of that run; so I have some catching up to do. But one must realize that their were oodles of special 1-2 shot books and accompanying annuals and chronicles within that series which are also integral to the whole series. And being a uber comic dork; I had to have them ALL! Also a footnote for the Age of Apocalypse; back in like 2005 there was a 10 year aniversary of the Age of Apocalypse. I picked up few of those that year, but didn't buy the entire run what-so-ever, too much sillyness if you ask me. Collecting them back 10 years hence was enough stress for me! "Weapon" Roman Numeral's program! As in the one Wolverine and Sabertooth, Silverfox, Wraith, Maverick, Frank Dukes aka Blob, and co belonged to. Last edited by MaileenasDad; 01-31-2010 at 01:06 AM.. I am so mad I could spit! Jackass editors. Thirty-five years of collecting...ENDED! I'm not buying another book until they bring him back to life! ya nice to pass the time..
i love to read comics. The old Uncanny's were great! The Chris Claremont and Dave Cockrum collaborations were the best, imho. That's when and where I first discovered Nightcrawler. I'm a Wolverine fan too, but usually only buy when he is teamed up with Nightcrawler. Those two together have excellent chemistry and it's always a blast when they are teamed up. Before Nightcrawler, Doctor Doom was my main character. I also read Morbius, the Living Vampire...a short-lived spin-off series from the Spiderman comics. I have a lot of DC titles as well, mostly Teen Titans. I am a Garfield Logan/Beast Boy/Changling fan. I lost track of him, but it seems he is making a comeback. I haven't been following the DC characters lately. I'm thinking of selling off all my books except the Nightcrawler books and Uncanny's with Nightcrawler. I might keep my Teen Titans series as well. Last edited by neling4; 06-09-2010 at 01:02 PM..
non Marvel titles it was The Brave and the Bold, Lady Death, Evil Ernie, Spawn, all Dark Horse comics dealing with the Predator vs. Aliens, also Batman vs Aliens as well. my oldest X-Men was the start of Days of Future Past...great story! Sentinels forever! Honorable mention: The Hulk when he went into his rage, was a great storyline. He took on everyone and beat them all. Were the Marvel Zombies bad guys...??? Afterall, it wasn't there fault they became zombies. I enjoyed those stories as well...that was so cool they ate Galactus the Devourer of Worlds!!! Cartoons....The X-Men on Fox was okay. They did suprise me with the Savage Land and Mister Sinister there. And even the Electric Hellfire Club. I remember the old Spider-Man cartoons from the 60's. and the Fantastic Four as well. Super Friends was lame. I enjoyed watching the Animated Spawn series on HBO about 10 years ago. Saw a few episodes of Hulk on Youtube. That was cool. When I was on Guam, during the last Stone Age, comics at the U.S. Navy Exchange were 10 to 25 cents. Our local TV station ran shows delayed one week, yep, NFL, MLB, NBA everything was one-week old, including the SuperBowl. Comics were fresh, I could barely wait for each months' shipment. I was a Marvel Keeper Of The Flame. I loved battles between Fantastic Four and Victor Von Doom. Spidey vs. The Goblin. Hulk vs. everybody. Captain America was about the only DC I liked, and there was a villain "Red Skull" and a series about "Sleepers" some type of Nazi war machines. hey, tear out the ads, not the comic pages! I came upon an interesting find the other day at a used book store, NDN comic books. I wasn't sure if I should laugh or if there was some good reading material there, so I bought them anyway, can't go wrong at fifty cents each. So I took these home and read them at my leisure. The first one was called Shaman's Tears, published by Image. This was probably the nicest one as far as artwork and story goes, and its printed on really nice glossy paper. I only have issues 3 and 4, so I do not have a really good clue on the story, but I am interested enough to want to find more of them. There is only one thing that bugs me about it though. I do not know if it was written by a white guy or an NDN, and I ask this because in #4 there is a very real depiction of a sundance. I don't however, see any kind of disrespect in any of the work that I have seen in it so far, other than the title is a little iffy. The other two, Scout, and Wardancer, are really out there. Scout is more like an old DC book, and published by Defiant. The other one is published by Tower and is just really out there. Not even really sure if it has a native theme or not but the main character appears to be native. I can provide more details later if asked, I do not have the books in front of me right now. And on the last two I am not 100% sure of the publishers names. Got a free comic from the base PX yesterday...it has a story of Captain America and he is in Afghanistan helping the troops there. Marvel does on annual issue..usually in the summer. Thanks Marvel! I have a Juggernaut "Super Hero Squad" action figure. It came with my Nightcrawler action figure. 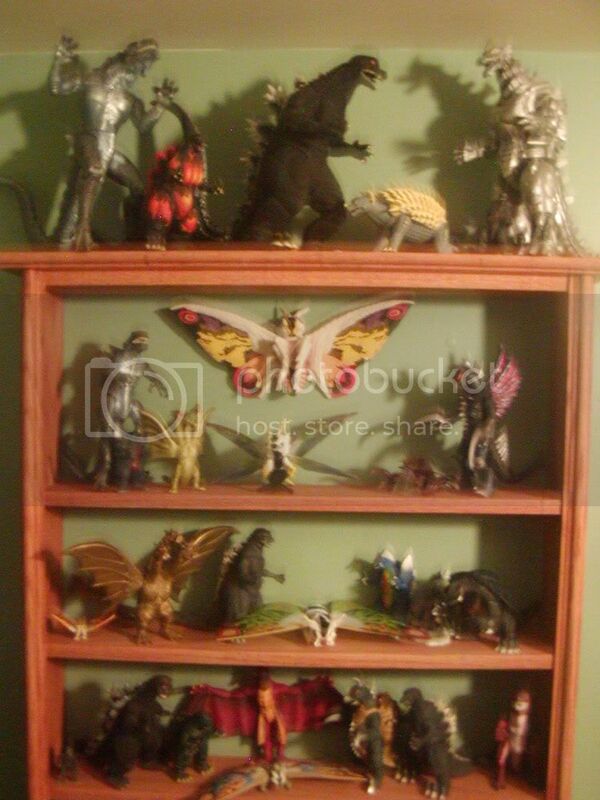 I had a Godzilla and King Ghidorah statue set, until my nephews got ahold of them. Also, an Alien egg that lit up, Queen alien with victim and chestburster, I got a big facehugger, facehugger in the egg, and the chestburster by itself. I liked reading and seeing the movies of the Aliens movies and comics. Only set I ever wanted in the end though was John Carpenter's, The Thing. Norris creature with spider head...This was from Todd McFarlane's Movie Maniacs series. Nice collection there, Ndnsoldierboy! Is that Mothra? Here is my collection: Nightcrawler (statue and figurine), two Wolverines (one is Weapon X), Doctor Doom, Juggernaut, Troll and Bashful, lol! That's Joe Q's wig they are attacking. Actually, it's a wig from one of my daughter's dolls. I don't think Joe Quesada has that much hair! Last edited by neling4; 07-08-2010 at 07:49 PM..
Yup, its Mothra...Mothra has changed alot thru the years...she even has her own movies out. I remember the Godzilla comics from around 1977-78. Back when it was 25 cents. But I also remember 12 cents too, I had a Spider-Man meets the Inhumans, featuring Medusa. Marvel has done lots of the portrait busts of their characters. It gets too expensive too keep up with.